Part of what has fed into that idea is the existence of so-called “savants” – people who have some isolated area of special intellectual ability far beyond most other individuals. Common examples of savant abilities include prodigious mental calculations, calendar calculations and remarkable feats of memory. These can arise due to brain injuries, or be apparently congenital. In congenital cases, savant abilities are often encountered against a background of the general intellectual, social or communicative symptoms of autism. 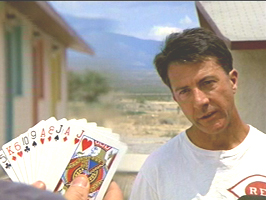 (The portrayal by Dustin Hoffman in Rain Man is a good example, based on the late, well known savant Kim Peek). It has been proposed that the intense and narrowly focused interests typical of autism can lead to prolonged practice of these skills, which thus emerge and improve over time. While certainly likely to be involved in the development of these skills, on its own this explanation seems insufficient. It seems more likely that these special abilities arise from more fundamental differences in the way the brains of autistic people process information, with a greater degree of processing of local detail, paralleled by greater local connectivity in neural circuits and reductions in long-range integration. This kind of focus on local details, combined with an exceptional memory, may explain many types of savant skills, including musical and artistic ones. As many as 10% of autistics show some savant ability. These “islands of genius” (including things like perfect pitch, for example) are typically remarkable only on the background of general impairment – they would be less remarkable in the general population. Really prodigious savants are much more rare – these are people who can do things outside the range of normal abilities, such as phenomenal mathematical calculations. In these cases, the increased local processing typical of autism may not be, by itself, sufficient to explain the supranormal ability. The idea is that such prodigious calculations may also rely on the concrete visual representations of numbers found in some types of synaesthesia. This theory was originally proposed by Simon Baron-Cohen and colleagues and arose from case studies of individual savants, including Daniel Tammett, an extraordinary man who has both Asperger’s syndrome and synaesthesia. I had the pleasure of speaking with Daniel recently about his particular talents on the FutureProof radio programme for Dublin’s Newstalk Radio. (The podcast, from Nov 27th, 2010, can be accessed, with some perseverance, here). Daniel is unique in many ways. He has the prodigious mental talents of many savants, for arithmetic calculations and memory, but also has the insight and communicative skills to describe what is going on in his head. It is these descriptions that have fueled the idea that the mental calculations he performs rely on his synaesthetic number forms. Daniel experiences numbers very differently from most people. He sees numbers in his mind’s eye as occupying specific positions in space. They also have characteristic colours, textures, movement, sounds and, importantly, shapes. 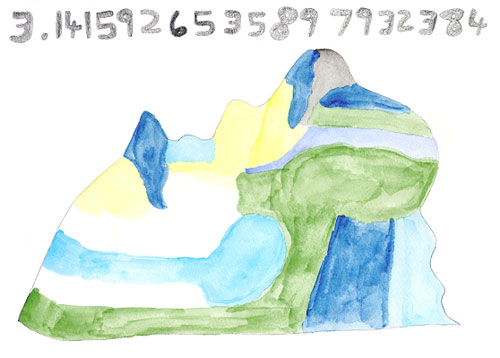 Sequences of numbers form “landscapes in his mind”. This is vividly portrayed in the excellent BBC documentary “The Boy With the Incredible Brain” and described by Daniel in his two books, “Born on a Blue Day” and “Embracing the Wide Sky”. His synaesthetic experiences of numbers are an intrinsic part of his arithmetical abilities. (I say arithmetical, as opposed to mathematical, because his abilities seem to be limited to prodigious mental calculations, as opposed to a talent for advanced calculus or other areas of mathematics). Daniel describes doing these calculations by some kind of mental spatial manipulation of the shapes of numbers and their positions in space. When he is performing these calculations he often seems to be tracing shapes with his fingers. He is, however, hard pressed to define this process exactly – it seems more like his brain does the calculation and he reads off the answer, apparently deducing the value based at least partly on the shape of the resultant number. Daniel is also the European record holder for rembering the digits of the number pi - to over 20,000 decimal places. This feat also takes advantage of the way that he visualises numbers – he describes moving along a landscape of the digits of pi, which he sees in his mind’s eye and which enables him to recall each digit in sequence. The possible generality of this single case study is bolstered by reports of other savants, who similarly utilise visuospatial forms in their calculations and who report that they simply “see” the correct answer (see review by Murray). Additional evidence to support the idea comes from studies testing whether the concrete and multimodal representations of numbers or units of time are associated with enhanced cognitive abilities in synaesthetes who are not autistic. Several recent studies suggest this is indeed the case. Many synaesthetes say that having particular colours or spatial positions for letters and numbers helps them remember names, phone numbers, dates, etc. Ward and colleagues have tested whether these anecdotal reports would translate into better performance on memory tasks and found that they do. Synaesthetes did show better than average memory, but importantly, only for those items which were part of their synaesthetic experience. Their general memory was no better than non-synaesthete controls. Similarly, Simner and colleagues have found that synaesthetes with spatial forms for time units perform better on visuospatial tasks such as mental rotation of 3D objects. Synaesthesia and autism are believed to occur independently and, as each only occurs in a small percentage of people, the joint occurrence is very rare. Of course, it remains possible that, even though most people with synaesthesia do not have autism and vice versa, their co-occurrence in some cases may reflect a single cause. Further research will be required to determine definitively the possible relationship between these conditions. For now, the research described above, especially the first-person accounts of Daniel Tammett and others, gives a unique insight into the rich variety of human experience, including fundamental differences in perception and cognitive style. Fascinating stuff. I do wonder how representative Daniel Tammet is, though. What about savants who don't have autism? (Or synesthesia, for that matter?). This theory seems like it'll explain Daniel Tammet and probably a lot of other people, but do you think it can explain savant syndrome in general? That's a good question. There may well be different types of savantism. It is estimated that about 50% of savants have autism, while many of the rest have some other developmental diagnosis, so whether autism per se is really involved in all savant cases is an open question. It is not known how many have this kind of visuospatial synaesthesia (especially as it is not a clinical condition and is thus not commonly screened for). That would certainly be an interesting and fairly straightforward study to answer that question! You mention that Baron-Cohen research article that includes Tammer as a subject. They seem to have found some hyperactivity in the PFC (as per the title I have not read the paper). Is that, in this case, considered to lead to a prefrontal control deficit, which would in turn favor local processing and fit one of the hypotheses you are describing? What is interesting is that Tammet seems to be a perfectly normal individual psychologically-speaking, which suggests a normally-functioning PFC. I recently blogged about an fMRI study on what changes in brain networks occur with literacy. One of the findings showed that the area of the brain that process written language also gets activated in response to faces and that this response decreases when one acquires reading skills. I also read on Tammet's wiki page that he speaks and reads 9 languages and... that he has impaired memory for people's faces! Wonder if the two are related... That is actually one of the prediction of that paper that I was commenting on. Those are great questions, thanks. The fMRI study of DT involved a number of different tasks, including the "digit span" task - a memory task where people have to recall a string of digits. These digits can be either structure (e.g., 24689753) or unstructured. Control individuals showed better recall of structured sequences and also greater activity in the lateral prefrontal cortex. The inference is that they are using the structure of the sequence to "chunk" the digits into meaningful subsequences. DT performed just as well for unstructured as for structured sequences and showed greater activation of the LPFC to both kinds of stimuli (in fact, he reported that he did not notice any difference between them, unlike controls, who readily differentiated the structured sequences). The inference is that his synaesthesia provides an inherent structure to any set of digits, which he sees as a landscape (like pi, above), so that he is always using that kind of chunking memory strategy. This particular study did not really address the other point you raise, about prefrontal control of local processing. You guys should check out the book "Moonwalking with Einstein." In one chapter the author makes a compelling case against some of Daniel's claims. I haven't read that book but have heard about it and it sounds interesting - all about techniques for amazing feats of memory, right? Starting with Aristotle's loci method, if I remember correctly (should have tried that method!). I would be interested to hear more about how it argues against Daniel's claims and which claims that refers to. I'd like to add to the posts above about Joshua Foer's investigations into Tammet. Joshua Foer presents a compelling case that Tammet's outstanding memory is the result of very intensive deliberate practice with mnemonics. In particular, in archived versions of his old website (www.danieltammet.com) from many years ago, Tammet says that his memory performance is the result of mnemonics and training. This casts doubt on Tammet's reported descriptions of his abilities in his books, which report that his abilities were acquired spontaneously at an early age rather than being acquired through training in adulthood. While not covered in Foer's book, there is also strong evidence from the scientific literature that Tammet's memory performances are the result of mnemonic training. "Routes to remembering - the brains behind superior memory", by Maguire et al from 2002, is a well known study that investigates the performance of 10 people with excellent memories (mostly competitors in memory competitions). It finds that all of the 10 reported training using mnemonics and intensive training to achieve their memory feats, and that superior memory was not driven by exceptional intellectual ability or structural brain differences. What appears to be less well known is that Tammet himself was one of these 10 participants in the study (although this is hardly a secret - Tammet said that he had participated on old versions of his own website, and savant expert Darold Treffert's repeats this information on his website). So we have a study that finds that Tammet's abilities are the result of training a "normal" brain, with no mention of synaesthesia or savantism. But this fact appears to have been almost universally ignored and forgotten about - I can find no comment on it anywhere in the scientific literature. Indeed, ironically, the paper by Bor, Billington and Baron-Cohen that you cite above actually cites the 2002 "Routes to Remembering" paper, as an example of a study of the "normal population with superior memories resulting from extensive practice", but the authors appear to be blissfully unaware that Tammet was a member of the "normal population" studied. Oversights like these, and a failure to investigate Tammet's background, have in my layman's view grossly distorted the reporting of Tammet's ability both in the media and in the scientific community. Lots of things are being written on Tammet which disregard the evidence that he has trained intensively using memory techniques, despite strong evidence that this is the case having been in the public domain for years. It's time that the whole scientific community took a more skeptical view of him, and challenge the media portrayals of him that suggest that his descriptions of his abilities are "scientifically proven", where this is not supported by a detailed and balanced reading of the scientific literature. At least, that's my take, although I'm not an expert myself - I would appreciate the expert view. Perhaps you could blog about it! Enjan, you make some good points, but I do not think that Daniel makes any secret of the fact that he uses mnemonic techniques for his feats of memory. The argument would be that his synaesthesia acts as a natural mnemonic and that his autistic traits include the kind of narrow and focused interest that would lead someone to even try to remember pi to 20,000 decimal places. Also, his calculation skills seem uncontested and are unexplained by any kind of mnemonics. Finally, I can say personally I find no reason to doubt his accounts - he seems quite a genuine and thoughtful person to me, for what that is worth. The explanation of his synaesthesia acting as a natural mnemonic has some plausibility, but also leaves some significant holes. In particular, it would imply that the researchers of the 2002 study completely missed the fact that one of the participants was using completely different memorisation techniques to the others. Furthermore, he participated in the 2000 world memory championship (under his birth name of Daniel Corney). He placed fourth overall, winning one event - the "names and faces" event, which requires remembering matching names and faces. Tammet reports no synaesthesia for faces, and indeed reports in his autobiography that he has significant trouble with recognising faces. So his best performance was in the event where synaesthesia could be expected to help him least. Further evidence is that if his abilities were a natural by-product of his synaesthesia, it might be expected that he would have shown his exceptional abilities at a reasonably early age. But evidence for this is weak. For example, the media vaunts his ability to learn a language in a week, while not mentioning that his school performance in languages was unexceptional (B grades in A-level French and German after many years' study). This is entirely consistent with him having learned memory techniques in adulthood, consistent with the evidence Foer presents. His calculation skills are uncontested, but also not hard to explain - they are unexceptional for people who have trained intensively (the Brainman documentary shows intensively drilled Japanese schoolchildren who would easily outperform him). "Why are some people ‘Memory Masters’ and others can’t even remember what day of the week it is? Everybody’s memory capabilities are roughly the same, rather it is a question of HOW WELL someone uses their memory’s natural capabilities. A ‘Memory Master’ is not somebody with superior brain function or above-average intelligence (though they may not like to admit it! ); all that separates them from most other people is that they have specially taught their memories to absorb data fully, quickly and accurately. I’m a very good example of this. If you had met me ten years ago and given me a shopping list to commit to memory I would have really struggled. It wasn’t that I was stupid, I just didn’t know the right tools and techniques. My school didn’t teach me how to remember, so I studied by myself and gradually developed the Optimnem course for maximal memory and Mindpower development and performance." None of the evidence here is completely conclusive. He might have synaesthesia, which might help his memory; he might have lied in his earlier internet postings claiming he was normal; the researchers in the 2002 study investigating exceptional memory might have somehow simply failed to notice that a unique one-in-a-million autistic savant with synaesthesia had come along to their study. But I think there's at least enough evidence here to proceed with a lot of caution and skepticism. For example, the paper by Baron-Cohen which includes his diagnosis of autism and synaesthesia includes a caveat that the observed "savant" memory might be achieved using standard mnemonics such as the method of loci. From what I've seen, that is a very important and necessary caveat that ought to be brought to the attention of everyone reporting on Tammet. "And you are correct that Daniel speaks a large number of languages fluently. Whether that relates at all to his prosopagnosia, I couldn't say." I think it is no accident that there is a clear effect of chronology on the content of the claim. The man has a past which is in conflict with his present. Looking For Co-Author To Write A Comprehensive Book/Story about my life! I have High Functioning Aspergers Syndrome. I have some Savant skills. I stopped work in 2007, mechanical Trades & Engineering. person. Only from words, images and video. Now that there are two of us we might form a club. Except neither one of us would ever attend the meetings. Nice blog to reading thanks for sharing such useful information this is very helpful for student who study Help Assignmentand keep continue to sharing useful information. Induced Savantism isn't that hard to come up with http://thoughtfulveg.blogspot.com/2012/03/neuroplasticity-created-rainman.html I don't have any Synaesthesia that I am aware of. I know of an individual who has passed, so there was no testing that I am aware of; however, ther is a huge body of work that speaks to different parts of Synaesthesia, and I have researched every combination or trigger listed. What I am saying is that there is remarkable memory, remarkable spatial abilities, remarkable color, hue and shadow and all of the visual is large scale. My question is , is there any way someone could look at one image and give an off-the-cuff impression. Even for this to be viewed by color number synaethete would be a marvel. Is there any synaesthetic research/testing that refers to extended dimensional placement similar to the discussions of months, years being spatially placed by synaesthetes. Specifically, a visual artist, interpreting a landscape into a 2d drawing, but the drawing becomes, infact all of his drawings become expansive multi-dimensional accounts of his viewings? Someone please respond. I am no rain man, but maybe, just maybe I am a little bit of this! Otherwise ASMR is the everymans way of getting a taste of synesthesia. i like to see work done on savantism good work keep it up!!! This post is the best. Truly. All the pure knowledge and legit information is in this post. This article is not like those articles which tell us fake news. This is legit. Thanks a lot for that.